It was a g ift first thing in the morning. 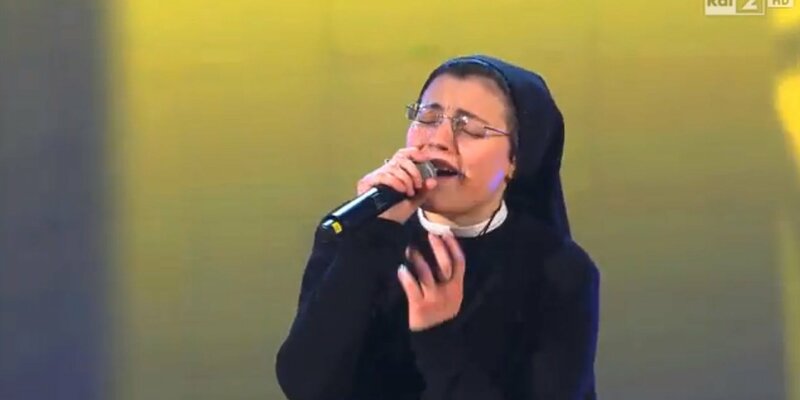 I noticed on my Facebook newsfeed a story about an Sr. Cristina Scuccia, an Italian member of the Ursuline Sisters of the Holy Family, and her stunning performance of “No One” (originally by Alicia Keys) on the Italian version of the popular tv show, The Voice. Her voice, enthusiasm, and spirit brought the crowd to its feet and tears to the eyes of at least one judge. Watch here. These are strong questions arising from a legitimate concern that our society of spectacle embraces even (or perhaps especially?) religiosity in a way that does not, at the same time, invite reflection and allow for the possibility of deep transformation toward God. “I came here because I have a gift and I want to share that gift. I am here to evangelize,” Sr. Scuccia said. Evangelizing, of course, can mean talking about the Gospel. But it can also mean embracing it and embracing the risk of spectacle, the risk of rejection, or even the risk of radical transformation. It can mean calling attention to the presence of God in the most unlikely places. Even on a tv show. Watching the clip earlier today made me all teary-eyed, and your post has had much the same impact. What you say about the Incarnation is so true. That is always the problem with God made flesh, we love to “profess” it, but so often we just can’t take the real thing. As I watched her, all I could think about what her sense of joy, how her whole body moved and how her voice rang out. I loved seeing her sisters in the back, so thrilled. And then I had the thought… I wonder how many people just do not think that this can be a nun. That nuns just can’t do that. Or worse yet, that they should not. I could make out part of what she said, and I know she was out there for Christ. It is a moving clip… in more ways than one! But your post, now that really adds food for thought. Thank you. Thank you, Fran. I had a similar reaction when I first watched. After reading Emma Green’s article, I began to wonder if she was right. But what really got me thinking was my own reaction to the performance–and I wanted to explore why I (apparently along with others) might consider that there’s something out of place about the whole thing. I think it’s ultimately less about a religious sister, per se, and more about our assumptions about the proper and improper place for God in the world. You certainly hit the target when you spoke of joy–and Teresa of Calcutta commented once that joy is the net by which we catch souls. Evangelization indeed. We compartmentalize our lives and put God in a little box rather than letting God be part of everything that we do and everywhere that we go. What a surprise to find out that God is there whether we expect God or not! God is everywhere and in everything and in everyone. Thank you for this post.